MINI will be launching a series of stunning collections with premium options called MINI YOURS. To celebrate the programme launch in UK, the first of these is the MINI Avenue. 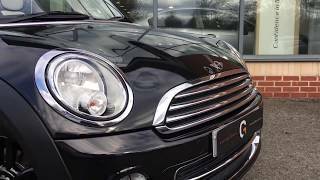 The MINI Avenue package is available with either Highclass Grey or Laguna Green metallic paint. The car’s standard spec includes Satellite Grey Soda Lounge leather with matching black floor mats, Bi-colour Sport leather steering wheel with multi-function controls, Soda mirror caps and special effect white bonnet stripes. The vehicle runs on 17-inch twin-blade spoke alloy wheels. The price of the exclusive MINI Avenue package is £4,880 on a MINI One or One D, Hatch, Convertible or Clubman, which means a MINI One D Avenue would cost £19,360 OTR. By offering a huge range of style, comfort, convenience and technology options, MINI has always been ahead of the pack at encouraging owners to personalise their cars. Now the British brand is taking this unique appeal and innovation to a new level of sophistication with the launch of a stunning collection of premium options, called MINI Yours. Walking into a MINI showroom, any customer can still personalise their purchase from the much-loved and comprehensive list of options. MINI Yours operates at the next level, turning the fun of deciding how your car is finished into an art form. Buyers can select a MINI limited edition such as the MINI Inspired by Goodwood, MINI Soho, Clubman Hampton or the recently announced London 2012 edition. These have all now been integrated into the MINI Yours programme. “The introduction of MINI Yours underlines MINI’s reputation as the benchmark car brand in customisation. The sheer number of options available through MINI Yours means customers can tailor-make their MINI using exclusive colours, designs and materials like never before; creating a MINI like no other on the road,” said Jochen Goller, Director of MINI UK. In addition, MINI will lend a helping hand to that process by creating a number of special MINI Yours packages. To celebrate the programme’s UK launch, the first of these is the MINI Avenue. 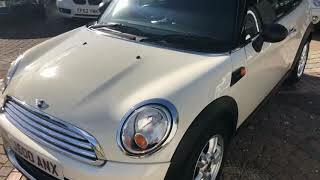 The MINI Avenue package is available with either Highclass Grey or Laguna Green metallic paint. Both feature an identical interior with an exclusive ‘Soda’ repeating design motif. The car’s standard spec includes Satellite Grey Soda Lounge leather with matching black floor mats, Bi-colour Sport leather steering wheel with multi-function controls, Soda mirror caps and special effect white bonnet stripes. The vehicle runs on 17-inch twin-blade spoke alloy wheels.